Love. Not Waste. - Become a happy activist! At Love Not Waste, we are happy activists, spreading the word on how plastic waste can turn into brand new products. We want to show you, surprise you, make you smile. That's why we showcase great sustainable brands, organize beach clean ups and fuel projects like Recky the Recycled Racket Machine and The Million Dollar Store. It's a bright plastics future! Alkmaar City Cleanup is a wrap, what an awesome day it was. 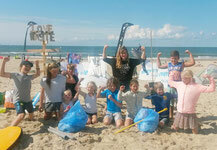 In total 783 people cleaned up 1.017 kilos of waste together. We set the record of biggest city cleanup of the country, read more. Do you believe, you can build a whole store that doesn't cost anything? We developed a store concept based on 3 basic principles that are changing the world right now. It's happening! Check it out! Love Not Waste loves to clean up the beach. Collecting new raw material for amazing new products. Follow our adventures online and check out the next clean up! This Summer we brought beach cleaning to a whole new level with Beach Clean Bingo. It is the most fun way to do something awesome for the planet! Read all about it here. Did you know it's also great for business team events, birthday parties or just a fun date at the beach. Learn more. For more info and bookings, get in touch! From September 2016 to April 2017 LNW hopped on a surf van and traveled the Atlantic coast from Holland to Morocco to clean the beach and create new stuff from ocean waste. To catch the vibe, watch below video made during the clean up tour in Morocco! Our enthusiasm and knowledge about plastic recycling comes together in our projects. We work together with both companies and volunteers to make dreams come true. Check out these awesome adventures! Change the world, start local. We collected the inspiring stories of local entrepreneurs who changed their business in sustainable ways. Read more! We brought happy activists together to build a machine that creates beach tennis rackets out of old bottle caps. Wanna know how we did it.. check out this video. Wanna know more about our current projects, check it out.